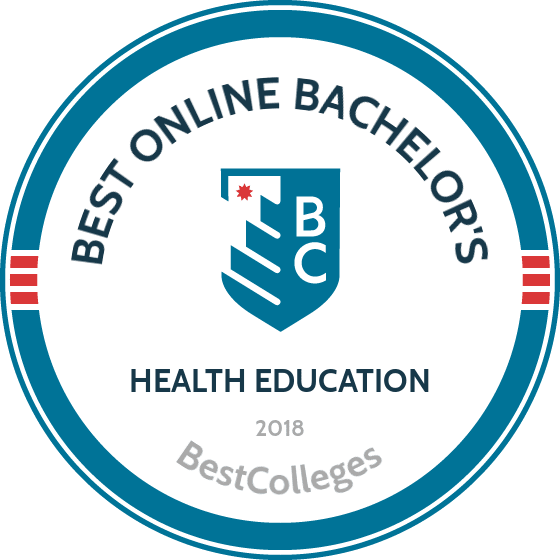 WHAT ARE THE BEST ONLINE BACHELOR'S IN HEALTH EDUCATION PROGRAMS? What Will I Learn in an Online Bachelor's in Health Education? Students in health education bachelor's programs learn to promote health through planning, implementation, maintenance, and evaluation of health programs for individuals and communities. Earning a health education degree online provides the skills to succeed in the multifaceted field of health education and to sit for the certified health education specialist exam. The U.S. Bureau of Labor Statistics projects employment for health educators to grow 13% through 2024, faster than the national average, making now the perfect time to earn a health education degree online. Founded in 1888, BYU-Idaho is affiliated with the Church of Jesus Christ of Latter-day Saints. BYU-Idaho offers a fully online BS in public health with a health education and promotion emphasis. Coursework is structured on a cohort model, in which students progress as a group. The program requires 120 credits and can be completed in four years of full-time study; students may take up to eight years to complete the degree. To be eligible for the online health education degree program, students must earn either a 3.0 GPA in a one-year PathwayConnect program, which combines online courses with local gatherings, or 15 credits with a 2.0 GPA from a school within the church educational system. PathwayConnect students who pursue a health education degree online pay their local tuition rate, rather than standard BYU-Idaho tuition. Students must adhere to the school's honor code and maintain annual ecclesiastical endorsements. Launched in 2014 with the mission of delivering a comprehensive offering of fully online baccalaureate degree programs, UF Online offers an affordable and convenient online health education degree. The BS in health education and behavior requires 120 credits and focuses on cultural diversity, including courses in minority and women's health issues and international health trends. Students complete a 15-credit, full-time internship during the last semester of the four-year program. Transfer applicants must have a 2.0 overall GPA and a 2.5 GPA in at least five of nine specific classes, including courses with lab components in biological science, anatomy, and physiology. Tuition rates for UF's online programs are substantially lower than residential tuition rates for both in-state and out-of-state students. Active duty military members and veterans may qualify for out-of-state tuition waivers or other financial assistance. UL Lafayette offers a BS in kinesiology with a concentration in health promotion and wellness. Courses include organization funding strategies, women's health, drugs in society, and world health issues. The online health education degree comprises 120 credits and can be completed in four years of full-time study. Students complete coursework entirely online with two exceptions, both of which can be completed locally: a clinical experience and an internship of 320 supervised hours at an approved site. Transfer students must have either an associate degree or 24 previous credits with a 2.25 GPA. Out-of-state students pay in-state tuition plus a per-credit support fee. The kinesiology program is offered in most states, though not all. Graduates are eligible to take the Certified Health Education Specialist exam. TUW was founded in 1970 in New York City as part of a network of Jewish-sponsored institutions of higher education committed to social justice and service to the underserved. The school offers an affordable health education degree online program in a global-minded educational environment; the BS in health sciences with a concentration in health education comprises 120 credits, including 24 elective credits, and can be completed entirely online. Class sizes are limited to ensure ample opportunities for personalized attention from instructors. TUW does not charge an application fee, and military students, veterans, and their families may qualify for tuition assistance. Transfer students with a 2.0 GPA may apply up to 90 credits toward degree requirements. Full-time students can complete the program in fewer than four years, and part-time students typically complete the program in seven years. Graduates are eligible to take the Certified Health Education Specialist exam. ASU, a research-focused school located in the greater Phoenix metropolitan area, emphasizes innovation and inclusivity. The school’s BS in health education and health promotion prepares graduates for careers as certified health education specialists. The program requires 120 credits and can be completed in four to five years. The health education degree online program includes courses in clinical informatics, stress management for wellness, and health behavior theory, culminating in a 12-credit supervised internship. Transfer students must have earned at least 24 credits or an associate degree with a minimum 2.0 GPA (2.5 for nonresidents). ASU accepts a maximum of 64 transfer credits. Active duty military students, veterans, and their families may be eligible for support services, including tuition assistance. The program offers six start dates per year, and distance learners pay in-state tuition. While program requirements vary by school, several courses are commonly offered in health education programs. Curricula typically involve planning, promotion, maintenance, improvement, and evaluation of community health. Below are sample classes common to most health education undergraduate programs. Epidemiology: This course uses statistical data and interpretation to examine patterns, causes, and distribution of disease outbreaks in specific populations. Topics include methods for managing the health of populations, tools for monitoring and evaluating population health, and factors influencing population health. Stress management: This course examines health issues related to stress and provides useful skills for wellness coordinators and community health workers. Topics include physiology of stress, biofeedback, relaxation, prevention, analysis of psychosocial stressors, and stress reduction methods to improve health. Clinical informatics: This course introduces biomedical informatics, emphasizing applications in clinical environments. Students learn about decision analysis techniques, searching and organizing text information, clinical decision support systems, and issues in implementation and use. This course prepares students for careers in health information management. Nutrition and health: Students examine principles of good nutrition throughout the life cycle. Topics include food composition theory, metabolism, supplementation, energy, fad diets, and preventive health promotion. Coursework also covers cultural and regional influences on dietary habits, nutritional requirements, and physiological development for fitness. Health behavior theory: This course introduces theories of health behavior change, with a focus on planning, implementation, and evaluation of health promotion programs. Students learn how to describe the role of social factors in public health problems and how to identify availability, acceptability, and accessibility of health care. Before pursuing a health education degree online, it's important to verify the accreditation status of potential schools. Through a peer review process, accreditation ensures that schools adhere to high standards of quality and continual improvement. There are three types of accreditation: regional, national, and field-specific. Regional accreditation is the most widely held and respected designation. National accreditation, typically held by technical, vocational, and for-profit schools, is less standardized. Field-specific accreditation for programs in public health is provided by the Council on Education for Public Health, an independent agency recognized by the U.S. Department of Education (ED). Programs which train students for careers as registered dieticians and nutritionists are accredited by the Accreditation Council for Education in Nutrition and Dietetics. Two organizations oversee accreditation standards: the ED and the Council for Higher Education Accreditation (CHEA). The ED recognizes accrediting agencies, and the CHEA ensures the academic integrity of agencies awarding national accreditation. To make sure you receive a reputable online health education degree, visit the ED and CHEA websites to find your program of choice in the comprehensive list of accredited programs and schools. Career pathways for online health education degree-holders typically involve research, assessment, planning, development, implementation, and evaluation of health initiatives. Graduates with supervisory and coordination skills, social and behavioral perceptiveness, and initiative to identify and address health needs will find a variety of employment opportunities in health education. Five of the most common careers for graduates of health education programs are detailed below. These professionals counsel organizations and individuals regarding health promotion and disease management through proper nutrition. They provide dietary plans and meal recommendations to meet nutrient requirements and promote healthy lifestyles. Most dietitians and nutritionists have a bachelor's degree, and many states require licensure. Epidemiologists are research scientists who study patterns that influence the spread of human communicable diseases and injuries. Through observation and experimentation, they investigate ways to reduce the risk and impact of diseases, and they report their findings to the public health media. A career as an epidemiologist typically requires a master's degree. Health educators provide guidance and instruction to help individuals and groups promote wellness and prevent disease. They develop and present institutional health education programs, evaluate participant progress, and support and advise people making behavioral changes. A bachelor's degree is required, and some states require licensure. These professionals help communities and populations understand health issues. They collect data, identify community needs, discuss health concerns, provide social support, and act as liaisons between the public and the medical personnel. They also implement health promotion programs and conduct outreach and advocacy. Wellness coordinators work in organizational settings to address employee health needs and promote healthy lifestyles through nutrition and exercise. They develop dietary plans, inform staff and clients about important news in wellness promotion, and evaluate health policies. This position typically requires a bachelor's degree. Salaries for health education careers are increasing, with median salaries ranging from $35,179 to $47,897. Professionals with an online health education degree and professional certification as a health educator reap benefits in later career stages, when median earnings reach $71,000. The table below features median salaries for bachelor's degree-holders in health education at various career stages. The first step toward financing your online health education degree is completing the Free Application for Federal Student Aid (FAFSA). You can then pursue scholarships and loans based on your qualifications and career interests. For example, students pursuing careers in public health can find scholarships from community organizations and public health associations, particularly if they are willing to work in underserved areas upon graduation.